What started on a whim has become one of my favorite types of fishing: marine microfishing. Tidepool Sculpins tend to be the most numerous micros in most Oregon coastal locales. After discovering microfishing in the Willamette a few days earlier, I took my time staying with my brother, Gabe, during Christmas Break to expand my microfishing horizon. After finding about as much success fishing from the pier as I’ve found dating in my late 20s, I decided to grab some dinner. This was the highlight of my evening, as I headed to Local Ocean Seafood, which, in my opinion, is the best seafood restaurant in the state and one of the best I’ve ever had. Their crab chowder isn’t quite to die for, but it would certainly be a part of my last meal if given the choice. Their rotating dinner menu and desserts are also phenomenal. Seriously. Take a moment and try them out. I returned to the pier that night and did a little fishing in the blackness before a lightbulb emerged over my head. I could try microfishing at night in saltwater, chasing sculpins just like I did in freshwater! The figurative lightbulb was replaced with a literal one as I donned my headlamp and took to the waters underneath the piers on the Newport waterfront. 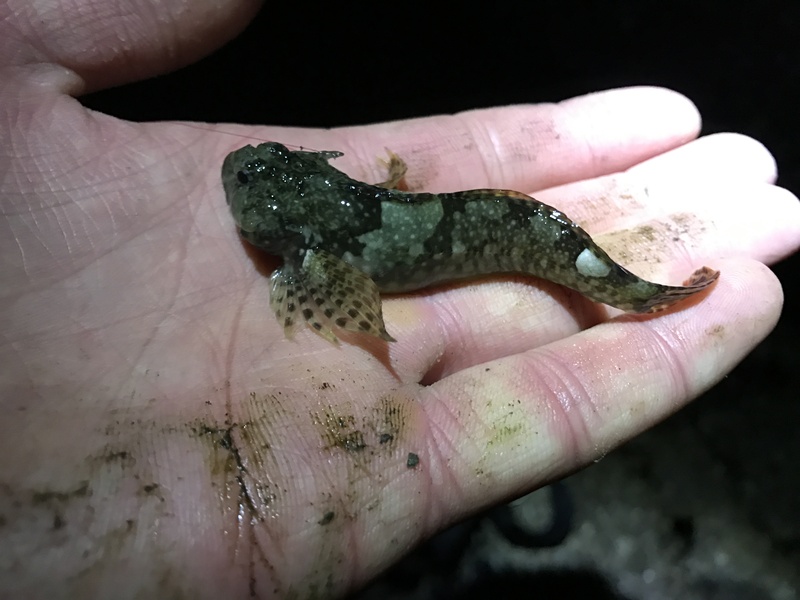 Tides were a little higher than I’d like, and I was wearing rubber boots instead of waders, but through a spot-and-stalk effort more akin to hunting than fishing, I finally hooked a sculpin … and promptly lost it. Fishing for these little guys involves a keen eye. You’ll have to spot their saddles against the aggregate, broken shells, rocks, sand, and kelp. It’s easier said than done over a broken bottom. 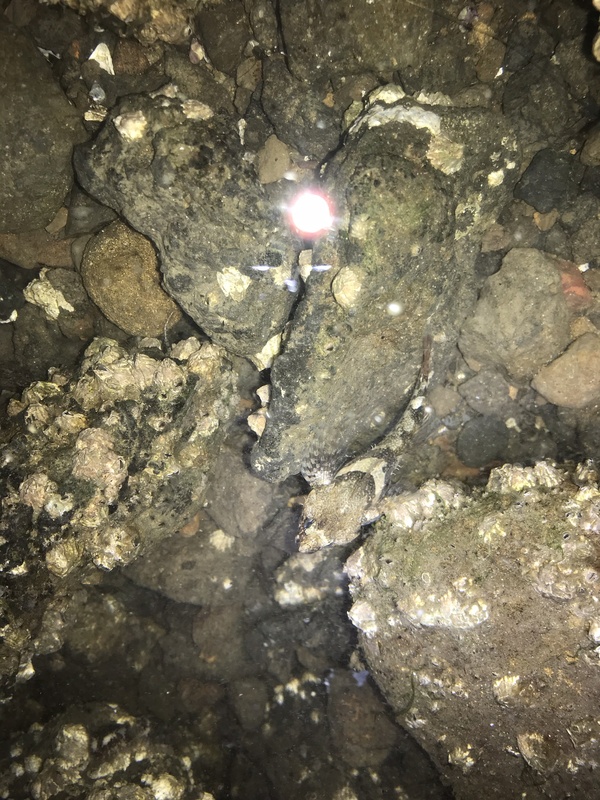 Can you spot the Tidepool Sculpin? If not, you won’t enjoy the “Where’s Waldo” book series. This excruciating process repeated itself two or three times before I finally landed one. I knew it was a Tidepool Sculpin, and I was stoked. Handling it wasn’t terribly easy, especially for a microfishing novice with cold, worn-out hands dealing with an Owner New Half Moon hook, but I managed to hold it long enough to snap this less-than-ideal photo for identification. I took that picture and began reading the Mola Marine Sculpin Guide, a link you definitely want to copy and save, just to make sure. 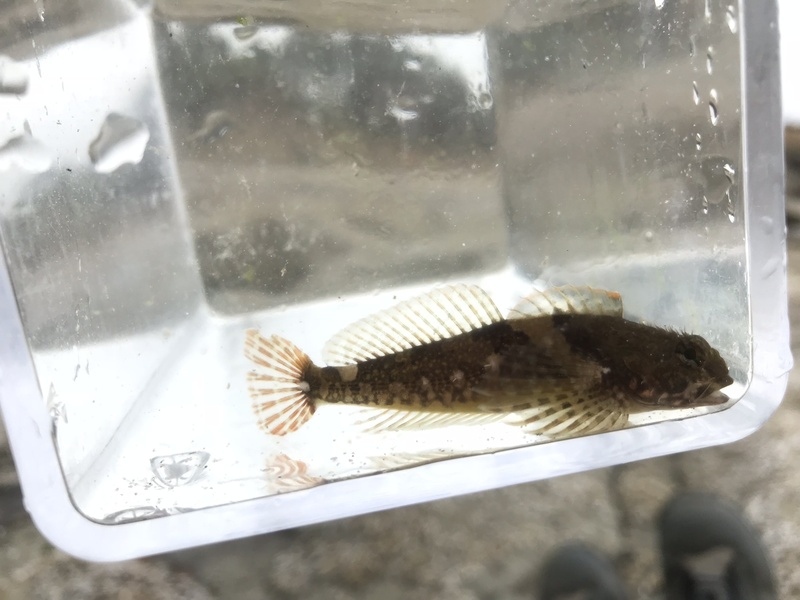 Tidepool Sculpins are not only the most common Oregon intertidal sculpin, they have (1) smooth skin and (2) a prominent saddle in between the dorsal fins with the open end of the V-shape facing back toward the head. It’s reversed in the species with which you might otherwise confuse it. 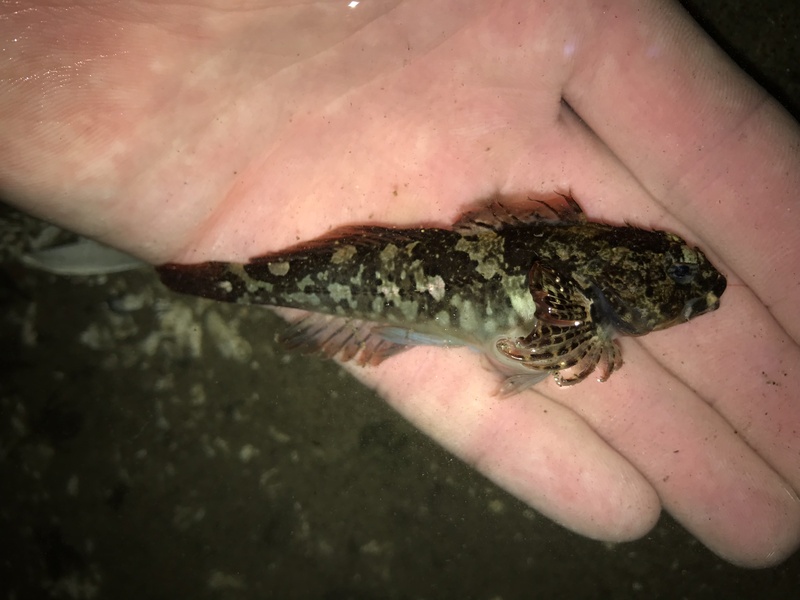 Tidepool Sculpins often wriggle in your hands which makes them look like tiny, adorable little sea dragons. Like, how cute is this lil guy? Ignore the assorted tidal filth on my palm. Though I thought I had it figured out, that was my one and only fish that night. I’d rose with the dawn, fished all day, and I was tired. I still had an hour to drive back to Corvegas, so I hopped in the car and went back to Gabe’s house one species richer. If you have micro gear, it’s virtually impossible not to catch a Tidepool Sculpin on your first attempt. Tides can throw off your success rates, but they feed just as actively during the day as they do at night. I’ve since discovered the beauty of tidepool microfishing, and though there are limited options on the Oregon Coast due to habitat protection laws, I’ve figured out a few places. But that, my friends, is a story for another day. Read the next entry in #SpeciesQuest here: Species #119 — Shortnose Sucker.